To make sure you continue to receive this e-newsletter, please add info@iononline.com to your address book. • Chronic lymphocytic leukemia (CLL). Efficacy relative to first-line therapies other than chlorambucil has not been established. • Indolent B-cell non-Hodgkin lymphoma (NHL) that has progressed during or within six months of treatment with rituximab or a rituximab-containing regimen. CLL: For Grade ≥3 hematologic toxicity or clinically significant Grade ≥3 non-hematologic toxicity, reduce the dose to 50 mg/m2; if Grade ≥3 hematologic toxicity recurs, reduce the dose to 25 mg/m2. Dose re-escalation may be considered. iNHL: For Grade 4 hematologic toxicity, reduce the dose to 90 mg/m2; if Grade 4 toxicity recurs, reduce the dose to 60 mg/m2. For Grade ≥3 non-hematologic toxicity, reduce the dose to 90 mg/m2; if Grade ≥3 toxicity recurs, reduce the dose to 60 mg/m2. Contraindication: BENDEKA is contraindicated in patients with a known hypersensitivity (e.g., anaphylactic and anaphylactoid reactions) to bendamustine HCl, polyethylene glycol 400, propylene glycol, or monothioglycerol. • Contraindication: BENDEKA is contraindicated in patients with a known hypersensitivity (e.g., anaphylactic and anaphylactoid reactions) to bendamustine HCl, polyethylene glycol 400, propylene glycol, or monothioglycerol. • Myelosuppression: Bendamustine HCl caused severe myelosuppression (Grade 3-4) in 98% of patients in the two NHL studies. Three patients (2%) died from myelosuppression-related adverse reactions. BENDEKA causes myelosuppression. Monitor leukocytes, platelets, hemoglobin (Hgb), and neutrophils frequently. Myelosuppression may require dose delays and/or subsequent dose reductions if recovery to the recommended values has not occurred by the first day of the next scheduled cycle. • Infections: Infection, including pneumonia, sepsis, septic shock, hepatitis and death has occurred. Patients with myelosuppression following treatment with BENDEKA are more susceptible to infections. Patients treated with bendamustine HCl are at risk for reactivation of infections including (but not limited to) hepatitis B, cytomegalovirus, Mycobacterium tuberculosis, and herpes zoster. Patients should undergo appropriate monitoring, prophylaxis, and treatment measures prior to administration. • Anaphylaxis and Infusion Reactions: Infusion reactions to bendamustine HCl have occurred commonly in clinical trials. Symptoms include fever, chills, pruritus, and rash. In rare instances severe anaphylactic and anaphylactoid reactions have occurred, particularly in the second and subsequent cycles of therapy. Monitor clinically and discontinue drug for severe (Grade 3-4) reactions. Ask patients about symptoms suggestive of infusion reactions after their first cycle of therapy. Consider measures to prevent severe reactions, including antihistamines, antipyretics, and corticosteroids in subsequent cycles in patients who have experienced Grade 1 or 2 infusion reactions. • Tumor Lysis Syndrome: Tumor lysis syndrome associated with bendamustine HCl has occurred. The onset tends to be within the first treatment cycle with bendamustine HCl and, without intervention, may lead to acute renal failure and death. Preventive measures include vigorous hydration and close monitoring of blood chemistry, particularly potassium and uric acid levels. There may be an increased risk of severe skin toxicity when bendamustine HCl and allopurinol are administered concomitantly. • Skin Reactions: Fatal and serious skin reactions have been reported with bendamustine HCl and include, toxic skin reactions, [Stevens-Johnson Syndrome (SJS), toxic epidermal necrolysis (TEN), and drug reaction with eosinophilia and systemic symptoms (DRESS)], bullous exanthema and rash. Events occurred when bendamustine HCl was given as a single agent and in combination with other anticancer agents or allopurinol. Where skin reactions occur, they may be progressive and increase in severity with further treatment. Monitor patients with skin reactions closely. If skin reactions are severe or progressive, withhold or discontinue BENDEKA. • Hepatotoxicity: Fatal and serious cases of liver injury have been reported with bendamustine HCl. Combination therapy, progressive disease or reactivation of hepatitis B were confounding factors in some patients. Most cases were reported within the first three months of starting therapy. 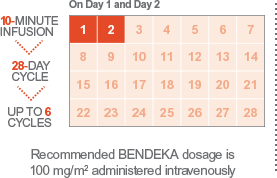 Monitor liver chemistry tests prior to and during BENDEKA therapy. • Other Malignancies: There are reports of pre-malignant and malignant diseases that have developed in patients who have been treated with bendamustine HCl, including myelodysplastic syndrome, myeloproliferative disorders, acute myeloid leukemia, and bronchial carcinoma. The association with BENDEKA has not been determined. • Extravasation Injury: Bendamustine HCl extravasations have been reported in post-marketing resulting in hospitalizations from erythema, marked swelling, and pain. Assure good venous access prior to starting BENDEKA infusion and monitor the intravenous infusion site for redness, swelling, pain, infection, and necrosis during and after administration of BENDEKA. • Embryo-fetal Toxicity: Bendamustine HCl can cause fetal harm when administered to a pregnant woman. Women should be advised to avoid becoming pregnant while using BENDEKA. • Adverse reactions (frequency >5%) during infusion and within 24 hours post-infusion are nausea and fatigue. • Most common non-hematologic adverse reactions for CLL (frequency ≥15%) are pyrexia, nausea, and vomiting. • Most common non-hematologic adverse reactions for NHL (frequency ≥15%) are nausea, fatigue, vomiting, diarrhea, pyrexia, constipation, anorexia, cough, headache, weight decreased, dyspnea, rash, and stomatitis. • Most common hematologic abnormalities (frequency ≥15%) are lymphopenia, anemia, leukopenia, thrombocytopenia, and neutropenia. Please see Full Prescribing Information for BENDEKA. Reference: 1. 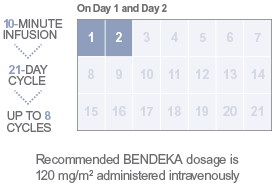 BENDEKA® (bendamustine hydrochloride) injection [Current Prescribing Information]. North Wales, PA: Teva Pharmaceuticals USA, Inc.
©2018 Cephalon, Inc., a wholly-owned subsidiary of Teva Pharmaceutical Industries Ltd. BEN-40752 January 2019.